Two cards that represent the character of San Francisco today. The top card is a compost giveaway from Recology, the City's garbage contractor. 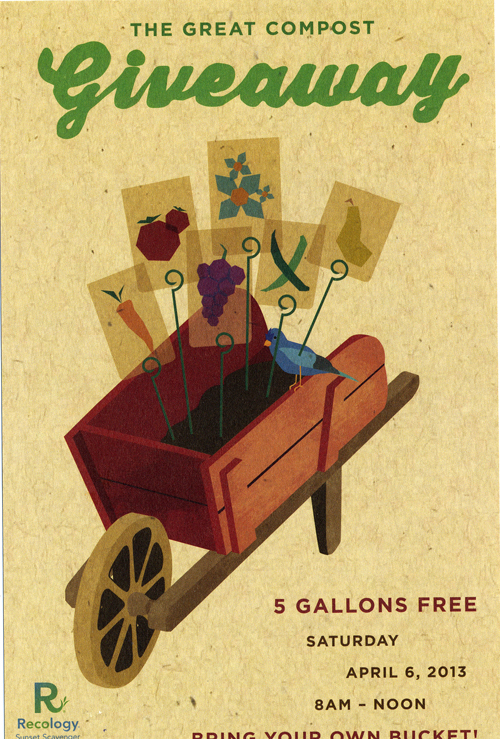 We have a free green bin where all manner of food is collected, recycled, and turned into rich compost. The bottom card is an ad card from ODC, a dance theater. 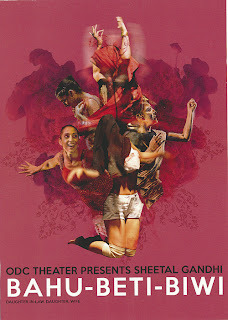 Bahu-Beti-Biwi stand for daughter-in-law, daughter, wife, and incorporates North Indian music traditions and family characters. Sounds cool to me! Gorgeous cherries from Poland and retro-colored flowers from Taiwan. 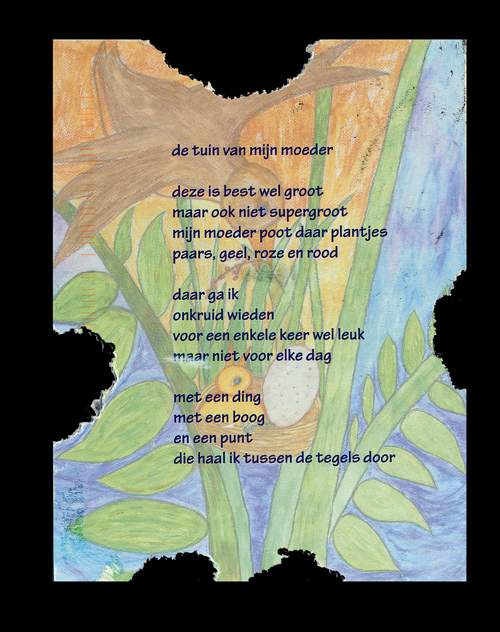 Card from a Dutch postcrosser. Her mice, Glow and Dark nibbled this card for me. She also affixed some of their poo on the back. Of course the postal folks on the Dutch side or the US side did not catch this. 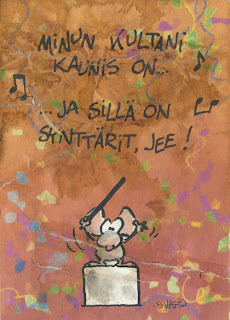 This was sent by a Finnish postcrosser. Originally it had a licorice candy bag glued on it. 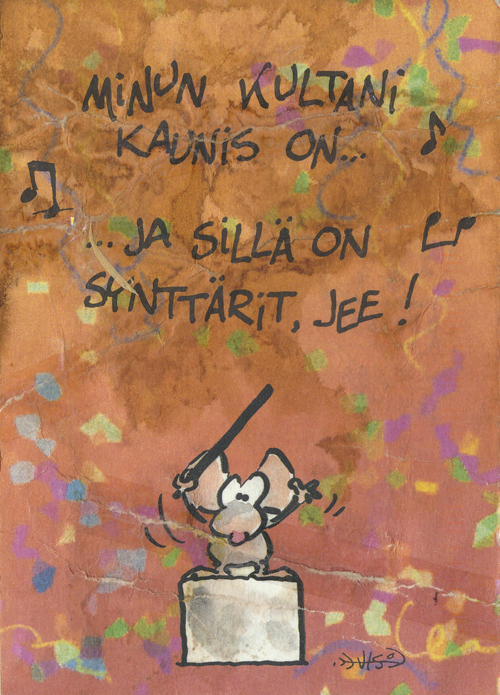 She wrote that the candies are called Sisu Horna and they are strong, salty (salmiakki) licorice. They are apparently white/beige pressed candies and turn to powder if you break them in half. The descriptions were so vivid, my mouth just puckers thinking about the salty candies. The Northern Europeans love bitter, salty flavors like licorice. I try to be bold when my friends hand me a bag of licorice but I end up spitting them out. 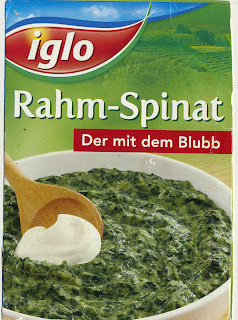 This card is by a German postcorsser who ate this creamed spinach for lunch. 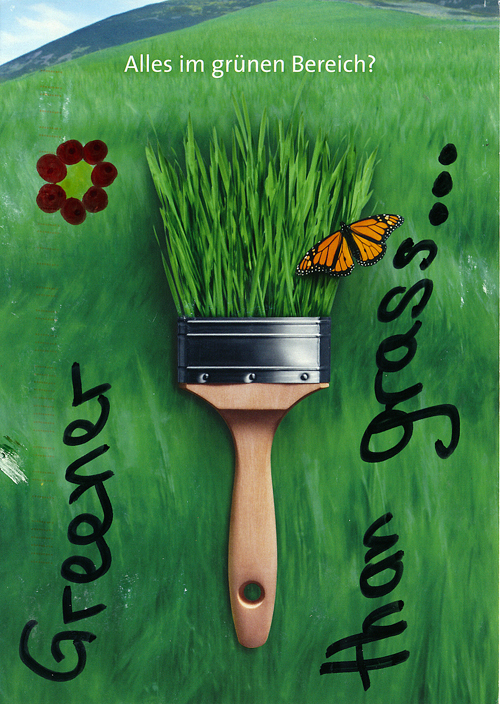 I love self-made cards such as this - it's a wonderful way to recycle and to share foods you like to eat. 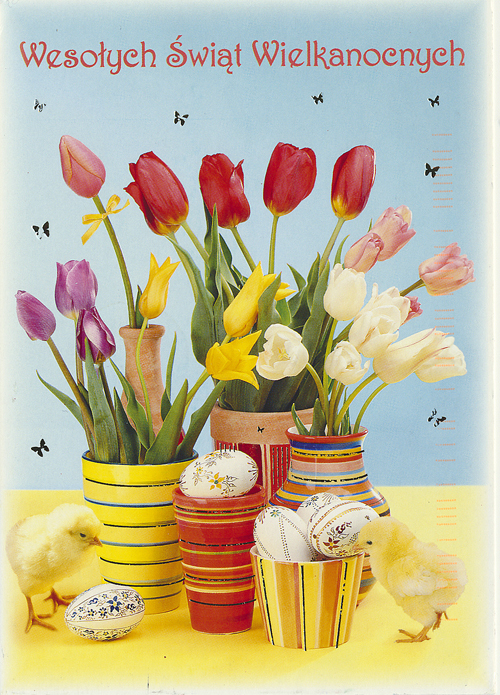 Here's a cheerful Easter card from a postcrosser in Poland. I love the chicks and stenciled eggs. And tulips are my favorite flowers. 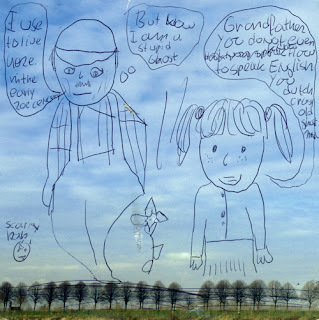 My request for an altered card was perceived as strange, but this postcrosser from the Netherlands created a sweet comic vignette with this card. 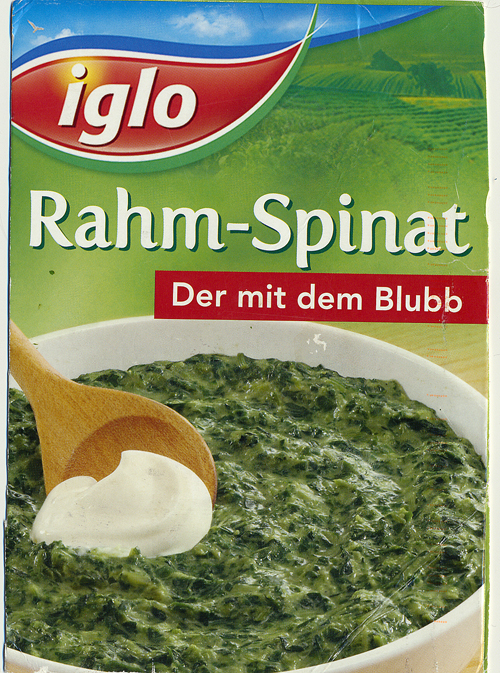 This postcrosser from Germany added an English translation to this paint ad card. Indeed greener! Susan sent me this card of a Chinese traditional medicinal herb garden at the UC Botanical Garden in Berkeley. 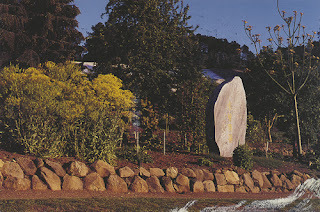 What looks like a ghostly shrouded figure is a stone tablet. She is helping a relative through an illness and no doubt this card struck a cord. 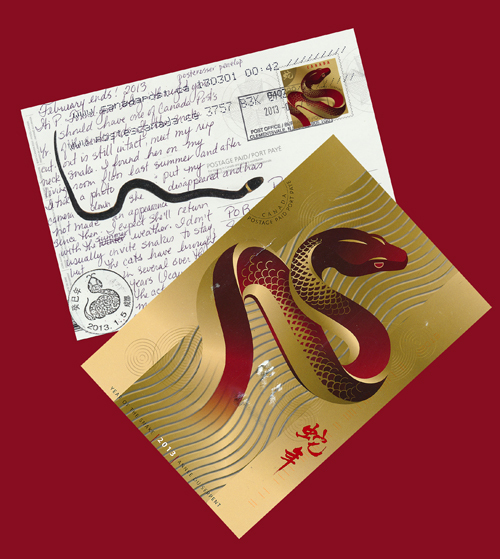 Two snake-related postcards arrived in my mailbox recently - how exciting! The top card is from Penelope, who is a postcrosser, but did not send the card via postcrossing. It is a card issued by Canada post, and so is the lovely snake stamp she used. 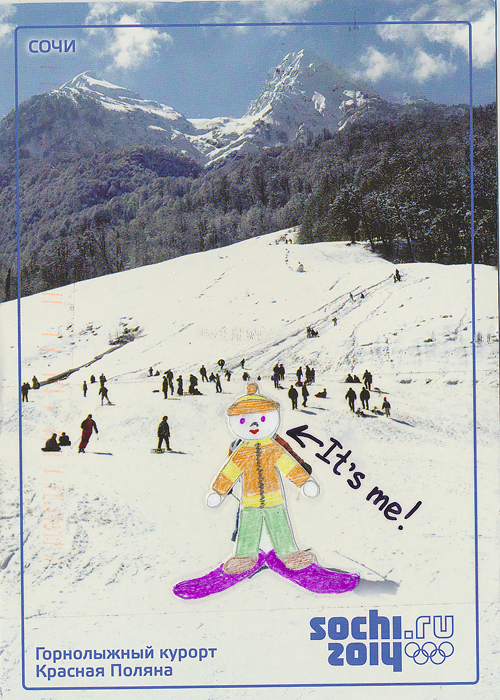 Thanks for this fabulous card, Penelope! 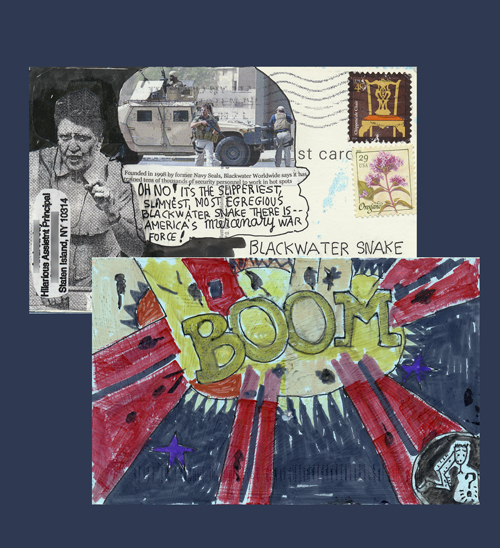 The card below is from mail artist "Hilarious Assistant Principal," who has sent me an anti-military establishment snake card. It is fabu!!! 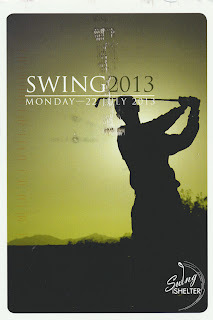 Out of the blue, I received this cool Nik Daum card from Wendy of Australia. Thank you so much! I did a bit of Google research and learned that Meatland is a novel/animation in the making by Daum. He is an artist from Indiana, currently living in my home town! 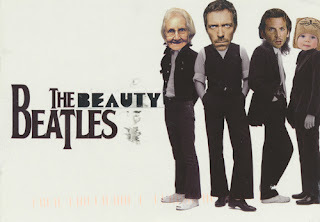 A fab four card from a Russian postcrosser. I guess the surviving Beatles are comparable to the grannie's age. And the House doc is looking very anti-Paul here.The cute dude has a passing resemblance to George and Ringo as a cute baby is spot on. I love this card from a Belarussian postcrosser. It has a postmodern feel to it - love the design elements, all the way to the ballpoint pen scribble cancellation of the stamp. 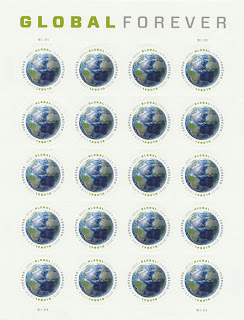 At last my local post office had these stamps available. I love the round shape and the world. North America is covered in grey, as if the Ice Age has started. Though I like to mix stamps for the $1.10 postage, its wonderful that a single lovely stamp does the trick too. My final card for the night...a collage card from a Ukrainian postcrosser. She loves reading, and so cut out book advertisements and collaged them onto this card. Love the cyrrilic text!! 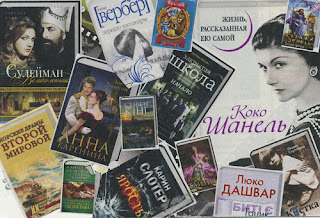 Do you know which book was written by Stephen King? 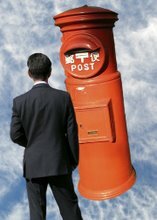 She added that she had to hang it to dry for a day so as not to cause damage to the postal employees. Thank you Eva, for getting into the spirit of altered cards! 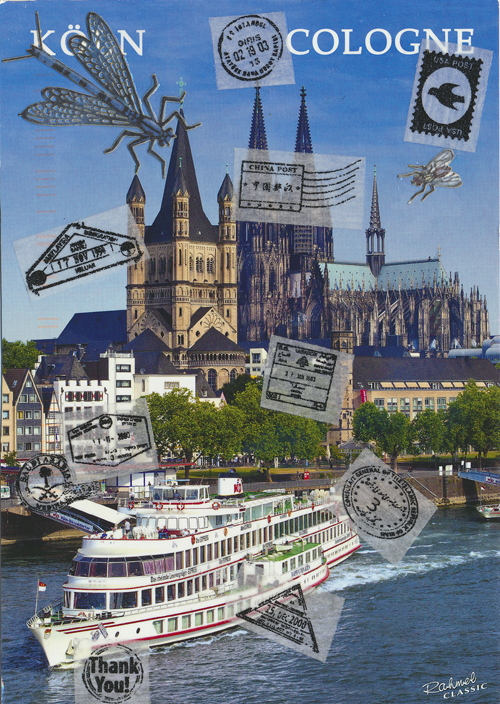 Here is a stickered card from a postcrosser in Cologne. 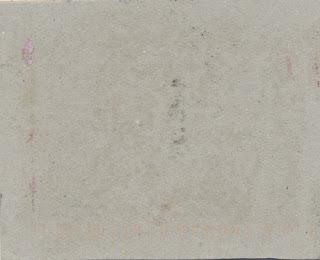 I love the postal cancellation stampings she made on the front. In the back, she had a group of postcrossers sign the card. 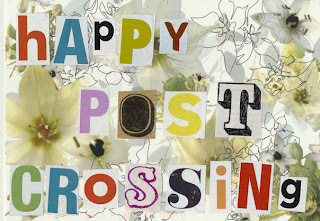 She attended an all-day Postcrossing meeting, where she met aficionados as well as the founder of Postcrossing, Paulo Magalhães and Ana Campos (designed the Logo). They all went shopping for cards, then wrote and signed a pile of cards, while exchanging stories about their postcrossing adventures. Sounds like fun! 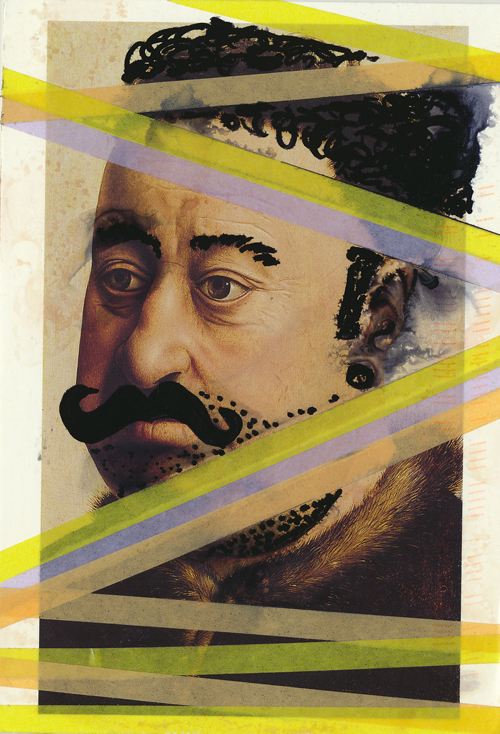 A fabulous card from an eleven-year-old Russian postcrosser. 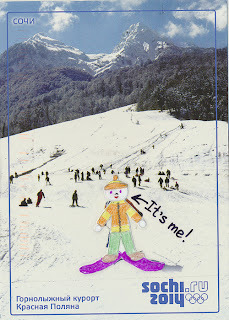 He says the card is from a ski resort called Krasnaya Polyana (red meadow). The Winter Olympics will be held here in 2014. 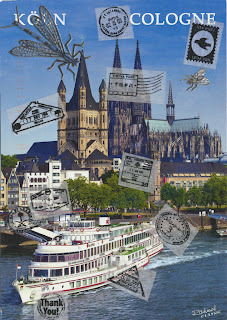 This card is from a German postcrosser in Lubeck. 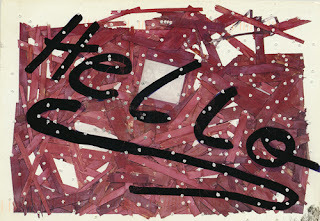 This card has been pierced many times with a needle. I love the texture and the snow-like results! 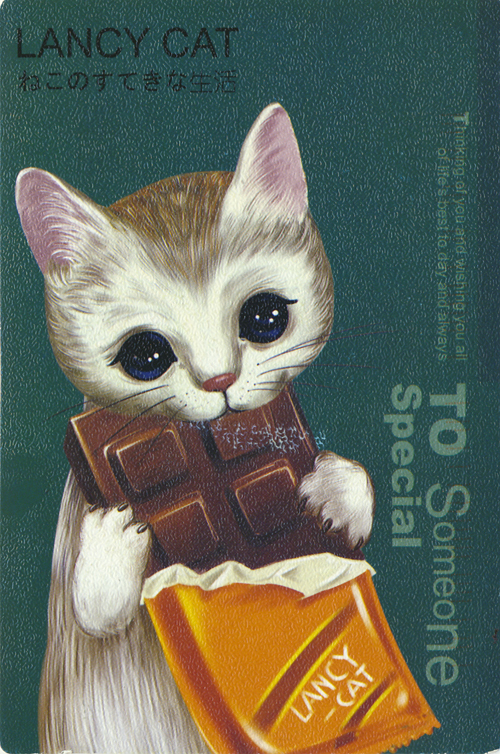 I received my first Lancy Cat postcard from a Taiwanese postcrosser. I googled "Lancy Cat" but its origins are obscure. I wonder if it is a version of Hello Kitty? 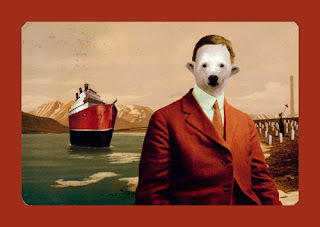 It looks retro, not quite like the Keane cats. 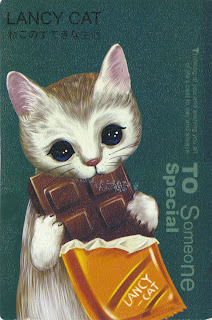 Quite cute...except that I think chocolate bars are toxic to kitties. From a postcrosser in the Netherlands. A very simple concept, beautifully executed. 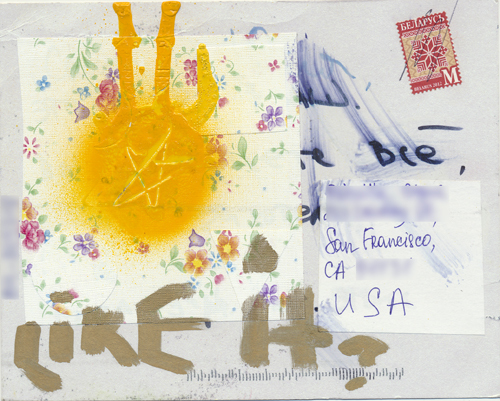 She took a daffodil flower postcard and transposed cut out letters on top. The result is a wonderful spring message. 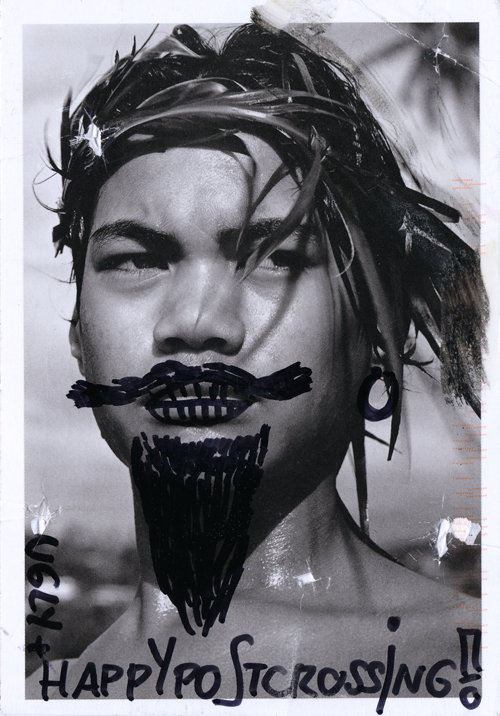 The young Tahitian boy card was sent by a German postcrosser from Nurnberg. 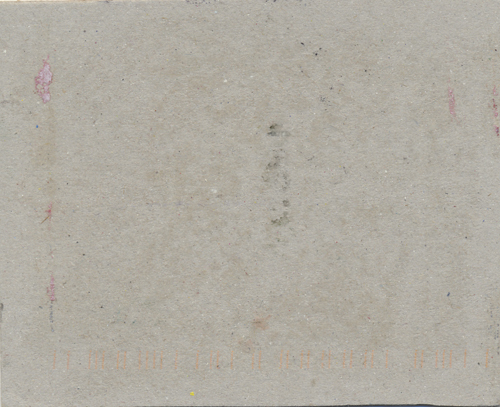 The lower card is titled Portrait of a Fat Man" by Robert Campin and was sent by a Swiss postcrosser. She drew a mustache, wrapped him with ribbon, and sprayed the card with perfume (Ambre Sultan), which turned it a lovely sepia color.